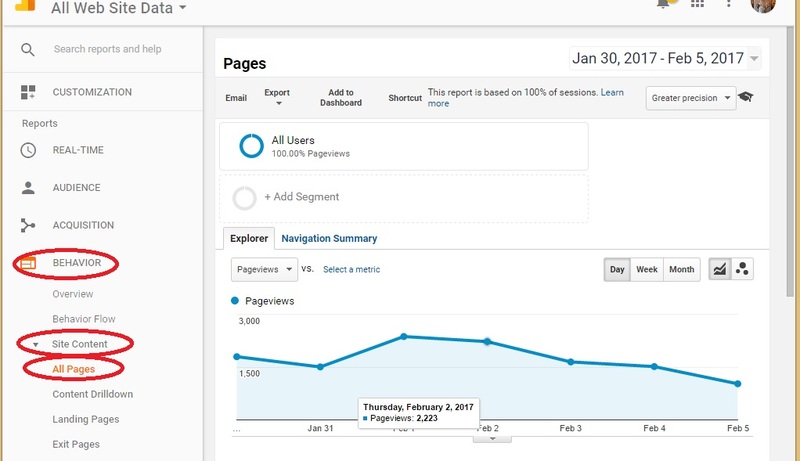 About a month ago, I explained how to get started with Google Analytics. Now that a month has passed, there should be enough data to populate the various analytics pages (analytics pages without data are not very informative). The sheer amount of information and options can be a bit overwhelming at first, so let's start with the thing people most commonly want to know about their site - traffic in the form of page views and how we might turn that information into useful, actionable product intelligence. 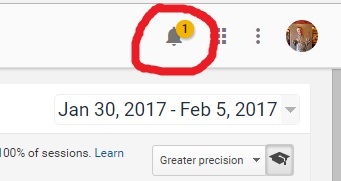 When you sign into analytics, be sure to take a look at new notifications. Sure, they may just be prompts for more services, but there also useful things in there. For example, on a site that had been set up a long time ago, the redirection had not been set up to funnel all "www.blah.com" traffic to "blah.com" and strip the "www". If you are not using analytics, this is not a problem, but if you are using analytics without the proper redirects, then your traffic is being split across those two hostnames, which makes it harder to get a clear picture of your traffic. How Does the Traffic to My Site Look? One of the most common questions people have about their site is which pages are being accessed the most and how many times. This falls under the category of "Behavior" in Google Analytics. While the Overview can be useful, in most cases the more useful place to look will be under Behavior → Site Content → All Pages. Page views can be very useful in assessing a web site, but the most valuable answers may require another layer of thinking. Let's say you have a page that is not getting a lot of page views. The only thing you can say with certainty is that the page has less views. When it comes to discussing the why, it's more complicated than "that page must be useless to my customer". The content is poor - not relevant to the customer, inconsistent with the site's overall "voice"
The content is valuable, but infrequently needed, e.g., "About Us"
But page views are only part of the story. We can get a much clearer picture by looking at exit rates and bounce rates. The bounce rate reflects how often someone accesses a single page on your site and then exits your site (as compared to the total number of all sessions involving that page). In other words, when that page is the only page from your site in that session. 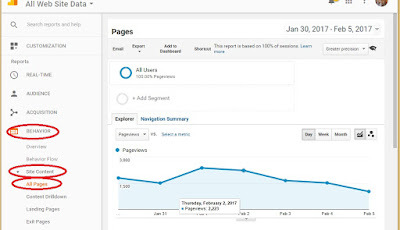 The exit rate reflects how often a given page is part of the session (one of the pages they visited) and it was the last page they visited on that site (as compared to the total number of all sessions that involved that page). In other words, when that page is the last page of a session in which multiple pages were visited. Shopping cart abandonment is a common problem for shopping sites. As of right now, Listrak is reporting ~79% abandonment for today. Let's say you are trying to evaluate your site's shopping cart abandonment rate and you are surprised to see a 90% exit rate from the step/page after an item has been added to a shopping cart. Some explanations. A probably issue is that information is being withheld until later in the process. Some might argue that it's clever application of behavioral psychology. Discussing the merit of such an approach is beyond the scope of this post. But we can speak to the obvious impacts on shopping cart abandonment. When a customer sees an item listed on your site, they assume they can buy it now, at a competitive price, and have it shipped soon. That expectation has been built and maintained by the bulk of online shopping sites. If you withhold that information or surprise customers with a change in that information, you may drive up your shopping cart abandonment rates. For example, some sites have/had an unusual approach for their shopping cart process. They would not show you the price until you had added the item to your shopping cart. With such a design, one would expect higher than usual abandonment after products are added to a cart, because the consumer only then finds out the price. Some shopping processes withhold checking availability until products are selected and they may have great reasons for doing it. Regardless, such an approach shifts the decision to end the session to when they are in the shopping cart process. Finally, there are the more complex issues - are you providing the products the market wants at competitive prices? Those are questions to routinely discuss, but maybe something changed if your shopping cart abandonment is spiking and it's time to move that discussion up. The point is that exit rate from pages can provide useful, actionable information. Since this product is primarily a web site, we expect this to be valuable. But what about a product in which the web site is just a small piece of the puzzle? Let's say you have decided to start a local music festival. You want to start small and see what the responses are. The site gets put up well in advance and you promote it through the right channels so it's turning up easily in searches. You start to see the bounce rate on your schedule page rise. Should you worry? Maybe, maybe not. Consider someone that bought a badge. The only thing they want from your site now is the schedule information. Don't forget that an attendee may end up bookmarking the schedule page for suture reference. But whether due to search or a bookmark, they will hit that page and exit, because they are already an attendee. For these cases, the increased bounce rate is natural. Because of the way you have designed the site and promoted it, you should see increasing numbers of people able to find your schedule page directly from a search. So, a prospective attendee can land directly on your schedule and realize they don't want to attend because they don't care for the musical acts performing. Initially, those would have been exits, but due to your success in search results, they can now directly find your schedule and make their decision from that one page. For these cases, the increase in bounce rate is a consequence of a successful awareness campaign but it may also be an indicator that people are not very interested in your musical line-up or scheduling. So, how could you decide if this is just within expectations or a bad thing? I would look at the rate of conversions on attendees. If your number of attendees grew, then it's probably just a natural consequence of how you built the site and marketed it; nothing to worry about. However, if people are not buying your badges and your bounce rates are continuing to rise, it may be time to reconsider your line-up, venue, schedule, etc. ; i.e., if you are providing a product people want. This might also inspire you to make your schedule more interactive. Now that you can see the analytics it becomes clear that providing a little more interaction on your schedule page, e..g, clickable links to see details on each performance or perhaps links to the musicians' sites. This small change in your site construction would allow you to get a better idea of how your visitors are consuming the information on that page and may also help guide your choice of musical acts in the future. As with exit rate, the point is that bounce rate can provide useful, actionable information. Even though our core product is not the web site, the analytics data from the site still gives us vital product intelligence. If you like quantitative data and analysis, you might get swept up in all of the fun ways to slice and dice the information. So, information junkies, take care. You have been warned. Those are just two scenarios with two data points about page views, and we have not even exhausted all of the data on page views, but you get the idea. There is a wealth of product intelligence we can obtain, even if a website is only part of our product/solution. There is a lot more than just page views, though, and we will discuss some of that in upcoming posts. In the meantime, analyze, but analyze responsibly.